The origins of Parque Patricios were less than auspicious. At various times it was the site of slaughterhouses, a cemetery for yellow fever victims, and a garbage dump that gave it a reputation as the Barrio de las Quemas (Barrio of the Incinerators). Alternatively, it was the Barrio de las Latas (Barrio of the Tin Cans, for the scrap metal that covered the outer walls of its precarious shanties). By the early 1900s, though, authorities tried to create a “Palermo de los Pobres” with broad open spaces – if only to brake the weekend invasion of working class families into areas frequented by gente decente (“decent people”). They designated the French landscape architect Charles Thays to get to work in the barrio’s namesake park, but his efforts never achieved the enduring success here that they did elsewhere in Palermo’s Jardín Botánico and elsewhere in the country. One challenge was to house the workers, and the prestigious Jockey Club went so far as to build a handsome barrio obrero (workers’ housing) to mitigate militant labor discontent. That, however, could not stop a 1919 strike against the Pedro Vasena steel plant that led to police and paramilitary slaughter of hundreds of workers throughout the city, in what is now commemorated as the Semana Trágica (“Tragic Week”). Today, that relative neglect persists in poorer neighborhoods. For more than a century, the Subte (as the underground railroad system is popularly known) has underserved the southern barrios and, inmost areas, it stops far short of the city limits, beyond which a far larger population must rely on buses and generally inferior surface rail systems to get to their jobs, or shopping. 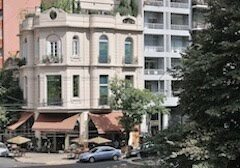 Within the Ciudad Autónoma de Buenos Aires (the “Autonomous City” is a self-governing federal district that, unlike Washington DC, has voting representation in the Argentine Congress), things for the transit-challenged are slowly improving. About a week ago, the system opened a new station at Parque Patricios (pictured at top, courtesy of Wikipedia). Municipal officials are making a big deal of this, but the glistening new station is only the seventh of 14 projected stations on the crosstown Línea H. It is just four blocks from the previous southern terminal at Estación Caseros and, for the time being, its northern terminal is at Avenida Corrientes. This leaves the prosperous northern barrios of Recoleta and Retiro still remote from those in the south. There’s something to be said to providing service first to those who must depend on public transportation, unlike those who have their own automobiles or can afford taxis, but it still leaves the transit-dependent without easy access to their jobs in those northern barrios. 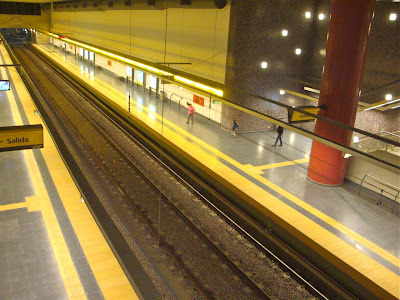 In Chile, as I wrote in an earlier comparison, Santiago’s exemplary Metro has managed to expand far faster, and more efficiently, over a much larger area, than the Subte has. Buenos Aires no longer burns or dumps garbage in Parque Patricios or other any part of the city, but its disposal continues to be a serious issue. According to the city daily Clarín, however, authorities are placing priority on a plant in the provincial suburb of José León Suárez that, by 2012, will recycle up to 20 percent of the 5,000 tons of trash that Buenos Aires residents generate every day. Much of its success, though, depends on a long delayed plan to get them to separate their household debris and, given the bureaucratic inertia let alone the need to educate the populace on the issue, the date sounds wildly optimistic.